A hearty dose of Dubbed out goodness. This brand new, good for you collection of samples from one of our most applauded producers of late features a hearty dose of Dubbed out goodness, live played instruments, Heavy processing and Musical inspiration – with a twist of additional processing which will appeal to the Dubstep producers out there, alongside the more Cinematic and Atmospheric production elite. Deep and Heavy Bass loops, Bubbling Organs, Clavinets and Wurlitzers sit alongside broken down Percussive loops, Bleeps, Dubbed Out Atmospheres and Echoes in a new collection of inspirational sounds and samples. 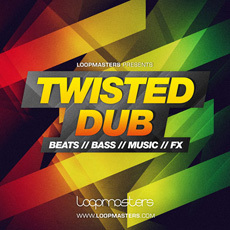 Twisted Dub weighs in at a mighty 1.5GB and includes 820 24Bit samples, which comprise 344 Loops between 90 – 142 Bpm, and an additional 470 One Shot Samples.